I’m an introvert. I like solitude & quiet. People are extremely important to me, but I am not a crowd person. Let me drink tea and talk to a friend for hours in the safety of my study & I’m happiest. I love being silent with others. When you can be comfortably silent in the company of another person, hold on tight to them. They are precious. I have had a decade of sharing beauty and treasured silence with André. We spent almost every hour of every day together. In all these years, we were only a few times apart at night. I have never been afraid of solitude. I’m not afraid of the dark. I’m good at being alone. Since I live mostly in my head, I can be alone anywhere with myself and be content. I know loneliness. We have met and reached a quiet understanding. She understands that she can never replace solitude in my life. Our house is full of memories. They hold me. I couldn’t return here in the darkness of that fateful night of 6 February when the last page of the most defining chapter of my life had been turned in the clouds above Brazzaville. Dear Friends took me in, said all the right words, hugged me, and then let me weep quietly through the night. In the morning, they took me home and have watched over me ever since. I do not fear the house, nor the dark. I am not alone. The people in my life have been a source of comfort and strength. I am so proud of the kind of relationships André and I nurtured in our life together. So grateful. I’m wrapped in love and kindness. I have never been as social as in the last few weeks. Totally out of character, but necessary and good. I’m surviving. There is very little I know. Nothing is predictable. I am only certain about knowing where I belong: here in Cape Town, home. An orchid lives in the bath where André spent so many hours, thinking. I cannot wash his handkerchiefs. I sleep in our bed. Our cats watch over me carefully. I bask in the sun in our wild garden. I’m returning to reading & writing. I dance alone at night. I walk along the shores of the Cape. I experience joy, deeply. Pleasure & delight have not left me. Our family and friends have kept me sane. I’m infinitely grateful. 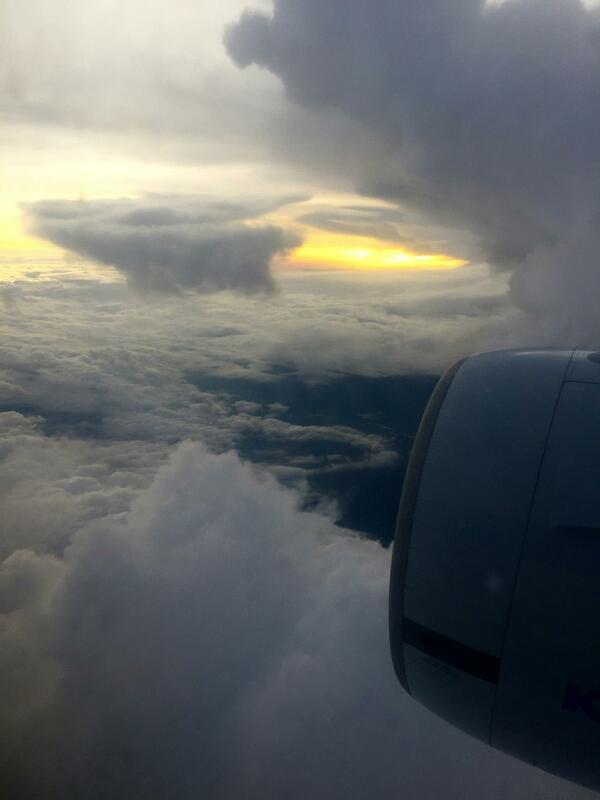 This photograph was taken over Brazzaville by the wife of the doctor who was on board our flight from Amsterdam to Cape Town on 6 February at the time when her husband was called away to assist a passenger in need. This entry was posted in Memories on March 29, 2015 by Karina. So much love expressed here. I shared this on my social media, and you have moved many to tears. Here are my arms to hug you.